When you need to conduct group training sessions or group tours in noisy areas, we have just what you need: High noise headsets with built-in communications radios. 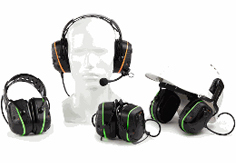 Choose a group pack and adjust by adding more headsets to meet your exact requirements. If you want all members of the group to have two way capabilities, just choose the number of leader headsets or opt for a Peltor Two Way LiteCom headset.